CoolSculpting is a non-invasive procedure and is the only FDA-approved treatment of its kind. There are nine areas approved for CoolSculpting treatment, including the often problematic abdomen, thighs, double chin, sides, arms, and more. The procedure is both safe and effective, making a real impact on the way you feel every day. A common misunderstanding is that CoolSculpting makes you lose weight. It couldn’t be more different! The CoolSculpting treatment is a fat reduction procedure that actually kills fat cells. Patients will undergo a treatment that cools cells to approximately 40 degrees Fahrenheit and for 30 minutes. It’s relatively comfortable, with no surgery like liposuction or other invasive procedure. Patients are encouraged to sit back and relax while the procedure does its work. While some may experience side effects during and after treatment, these typically resolve within days or weeks. In the short procedure, the fat cells in the treatment area will begin the process of crystallizing, dying, and being processed by the body’s natural filtration systems through the kidneys and urine. After the procedure, these cells are gone, and can no longer store excess energy from food. This results in a flattening and size reduction of the treatment area, allowing clothes to fit looser and show a more toned appearance. Many patients experience results within 2-6 months after treatment and can achieve lasting results. 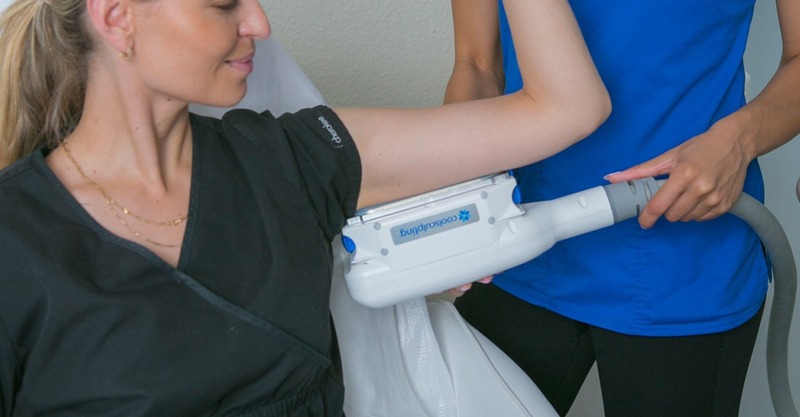 While the technology for CoolSculpting has been around for more than a decade, recent advancements and research have increased effectiveness and popularity among aesthetic medicine patients. In fact, CoolSculpting began when a scientist discovered that children who eat popsicles often had fewer fat cells in their cheeks. And thus, CoolSculpting was born of applying that idea to fat cell reduction in adults. CoolSculpting helps kick yo-yo dieting to the curb because it changes the number of fat cells in the area was treated. Your body stores fat differently as a result. The ideal CoolSculpting candidates are already working hard to maintain a healthy routine of diet and exercise. While there’s no magic cure or replacement for a healthy diet and exercise regimen, a CoolSculpting treatment can help achieve the desired results of fat reduction. If you’re working hard to lose belly fat on your own, we encourage you to consult a licensed medical professional for recommendations on what treatments are best for you. Patients that experience the best results are diligent about maintaining healthy habits after their CoolSculpting procedure. SDCoolSculpting, a division of SDBotox, has more than 5 years experience and has treated more than 10,000 patients in aesthetic medicine. A leader in San Diego for non-invasive procedures, the highly qualified team of doctors and nurses at SDCoolSculpting dedicates itself to providing a comfortable and personalized treatment plan for every patient, based on the latest innovations and research in the industry. Visit one of our two locations in Hillcrest and Pacific Beach for a variety of services, including Botox, CoolSculpting, Laser Hair Removal, and Dermal Fillers. We invite you to book a free consultation and see what we can do for you. Learn more about our CoolSculpting services.